It's modern. It's bold. And there's nothing else like it in the Beach community. Cutting edge design and an unbeatable location have made Beach Hill Residences a hot destination for young urban homeowners who want to live in a space that really stands out. 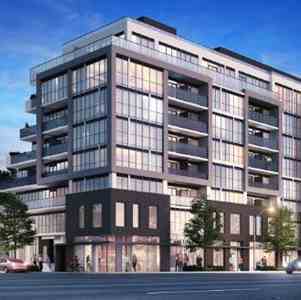 Beach Hill Residences is a new condo project by Carlyle Communities currently in preconstruction at 763 Woodbine Ave in Toronto. 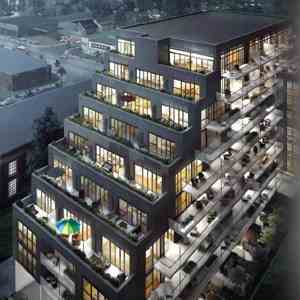 The project is scheduled for completion in 2015. 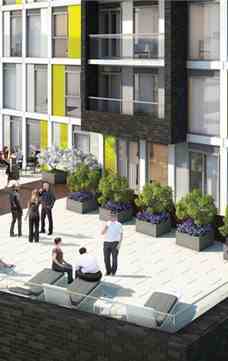 The project has a total of 64 units. FAD Fashion District Condominiums will be 17 storeys high, containing a total of 186 units, with a 4 storey below-grade parking facility that will accommodate 65 parking spaces. Floor to ceiling windows, pre-finished engineered wood floors (exclude bathroom & laundry room), porcelain floor tile in bathroom, deep soaker bathtub with tiled skirt, European style kitchen cabinetry, stone surface counter top, tile backsplash, front loading washer & dryer, stainless steel ENERGY STAR fridge, gas cook top, electric built-in oven, integrated dishwasher, exhaust hood and microwave oven. Located at the crest of a hill overlooking the charming Beach neighbourhood, this is a building that definitely doesn't blend. 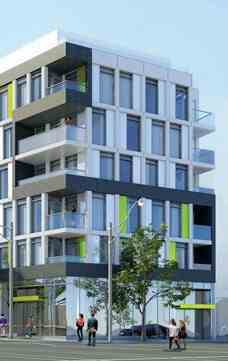 Contemporary architecture by RAW Design and a high-contrast black and white exterior are punched up with bright green accents that bring youth and playful colour to the area, and breathe exciting new life into the community. Stylish interior spaces designed by Union 31 reflect a beautiful, thoroughly urban sensibility - all in a landmark building that's redefining Beach living. Unit Size: From 483 Sq. Ft. To 964 Sq. Ft.
Carlyle exists for the forward thinking. 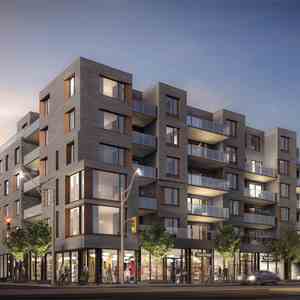 Specializing in urban developments in Toronto’s most sought-after neighbourhoods, Carlyle utilizes a bottom-up approach in all facets of the development process.